Is your kiddo starting to smell a bit ripe, not just like that body odor type of stank but like the wretched reek of death? Is he digressing from actual words to lesser moans and groans? Has he been trying to bite your head off instead eating the mac&cheese or PB&Js you prepare for his lunches? Well, then we think it's pretty clear what's going on here. Puberty has finally hit and your little boy is turning into a teenager! Haha, no we're only joking! That would be absolutely terrifying, however, we think you may have a zombie on your hands! Now rather than trying to send your undead monster back to the grave, show your love and support! 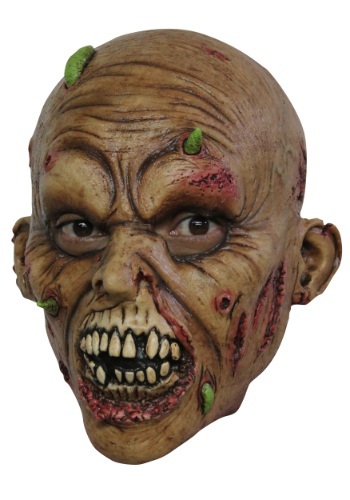 Make your kiddo the scariest zombie on the block! Use this Child Zombie Mask to give your little one a more decomposed and creepy look! Teach him the slow and staggered walk of a typical zombie, and the importance of a pack mentality as well! Always stick with the horde, less you want some tasty morsel to decapitate you! That's zombie rule number one! Number two has to do with proper dental hygiene, after all, one can't bite through flesh and bones every meal without a good set of chompers!